Alarm bells were ringing throughout the Hilton Resort. Apparently there had been a shooting. A U.S. Senator was in custody but security believed there was an unknown accomplice on the loose. The scene was one of quiet pandemonium. People in ones, twos, some with kids in tow, lugging suitcases and carry-bags to the boarding ramp of the Lancer Cruise Ship. All of them seemed subdued and yet excited, even agitated. They knew they were embarking on a one way voyage to an unknown future. All of them were leaving behind something — jobs, loved ones, a lifetime’s worth of accumulated possessions. Even security and certainty — as much as a UNWG controlled government allowed — was behind them. It is perhaps testimony to the — try as the United Nations World Government might attempt to quell it — indomitable spirit of adventure and courage of mankind that so many ordinary folks could pack a bag on a moments notice and abandon their way of life to start a new one, on another world, where hardship would be the norm. “Er, Brice Halsworthy. I’m a retired teacher,” the gentleman replied. “I’ll be back with others in a while. You wait until then,” the UNWG agent commanded. With that, he turned and ran off down the corridor. The Lancer began picking up speed. Indeed, it was new, one of the fasted tour ships ever built, with four DEE-HEE Engines providing speeds near 1/3 liears a possibility in open space. That was faster than most UNWG patrol ships could muster even on a good day. Looking out one of the triple-paned zirconium windows, Glenda could see that the pilot, Larry Monroe, was accelerating the ship for all she was worth. As the ship pulled away, it also began slowly rotating to provide a modicum of centrifugal gravity so people could walk around. Everywhere there was the animated chatter of people introducing themselves, inspecting their surroundings, looking through the windows at the shrinking Hilton Orbital Resort. “Yes, Steven,” she replied into her wrist-pad. There was a hush from the crowd of future colonists and Glenda herself became queasy at the thought that the mission to Alchibah might be over even before it started. Then everyone started talking at once as everyone thought about the impact the news might have. Would they have to return to Earth? Would they be arrested? Glenda paused for a moment, took a deep breath, and tried to think how to reply. Just then, in what could only be described as an act of providence, the pilot’s voice came over the loudspeakers. Captain Monroe, like most pilots who had cut their teeth in the early days of space travel when living quarters were tiny compared to on ships today, was shorter than most men, only 5′7″, but 48-years-old he still had the build of many of them who worked-out in the gym to excess to compensate for the long periods of reduced or no gravity. He still had all of his jet-black hair and also affected a handle-bar mustache, something of an anachronism in this day and age. He had been flying space cruisers and tour ships for 15 years, ever since he was dishonerably discharged from the UNWG Planet Patrol for refusing to arrest asteroid home-stake-claims miners who refused to comply with World Government regulations on “diversity quotas” in hirings in all industries. He believed that you should be judged by your ability and actions, not any other factor. He found a sympathetic employer in StelCo Industries and has been loyal to a man he’s never actually met, R.J. Hamilton, ever since. His co-pilot and engineer, Arte Clark, was much the contrast. A farm boy from Nebraska who worked his way through Astro-College, and immediately upon graduation three years ago had been recruited by StelCo. He was 6 1/2 feet tall, had skin as fair as pink rose, and shaved his head and face clean. Oddly enough, this seemed to please the crowd which sent up another round of cheering as they buckled themselves and their children in. It would seem that everyone knew they were in this together and, because most of them had been chosen for their shared libertarian-dissident spirit, felt that it was better to die on their feet than to serve on their knees as the saying went. A sudden jolt interrupted Monroe, travelled through the ship, knocking over passengers’ computers, plastic champagne glasses, children’s crayons. Everyone became silent. Another blast followed. Another blast from the Goon Ship rattled through the Lancer but her shields held. 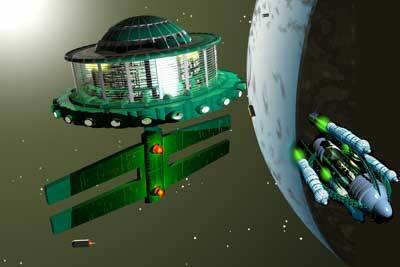 Besides, she was a big ship compared to the puny Goon patrol cruiser. “Watch and learn, Arte. Sometimes a primitive offense can defeat a modern defense. Captain Monroe’s hands began working the new console, bringing the Goonie Ships into view on two of the small vid-screens, centered in the red crosshairs. He then punched two red buttons and within seconds one Goonie Ship exploded and the other was suddenly without it’s engine tail. He re-aimed the crosshair and fired again. The second ship blew into pieces in all directions. “Sorry, that was a bit condescending. Anyway, for the last 30 years, all UNWG space ships — indeed even their ground forces — have only been equipped with lasers, tasers, zap-guns, and other variations that emit various forms of electromagnetic energy. Since personal craft that you or I would own as well as commercial vessels have never been equipped with any form of weapon, much less any defense, the Goonies have come to rely solely on their zap-arms and the ASRS shields. R.J. Hamilton was a genius and outfitted the Lancer with four gyro mounted 100mm guns and their incendiary, explosive ammunition that he, er, appropriated from a decommissioned early century naval ship. There were several others there and they soon began introducing themselves to each other and discussing everything under the Sun, or rather, the stars. Unobtrusively, the one dubbed The Historian decided this would be a good time to turn on his wrist-pad microphone and perhaps record for time immemorial the early comments of some of the colonists.